You are here: Home / General Crafts / Easter Gnome – The Perfect Easter Bunny Gnome DIY! 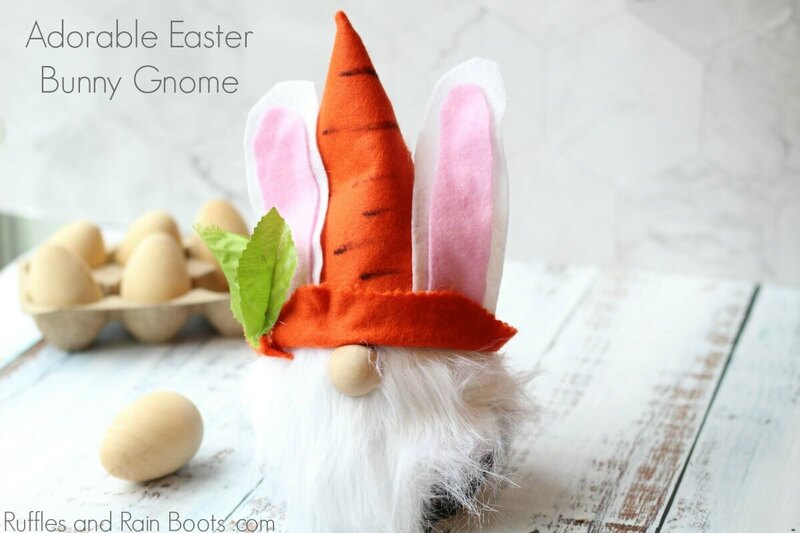 Easter Gnome – The Perfect Easter Bunny Gnome DIY! 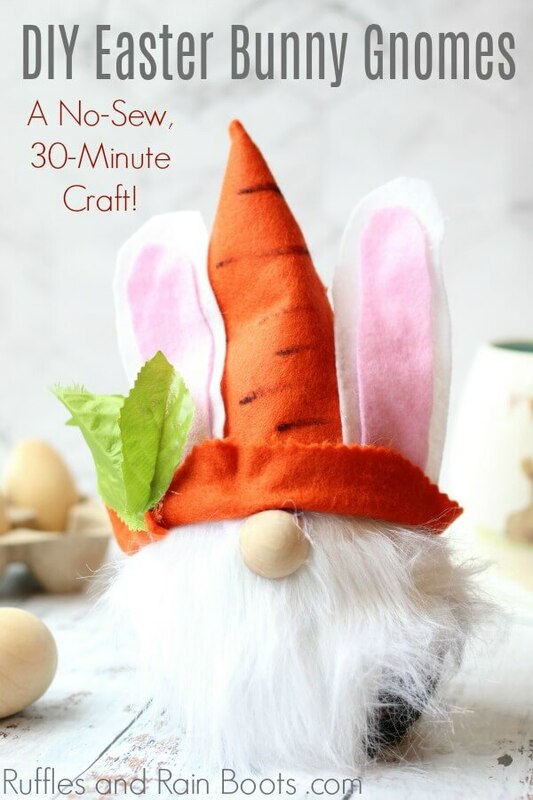 This no-sew Easter gnome tutorial is going to make everyone say, “Aww!” It’s a quick DIY with basic craft supplies, so let’s get started with our bunny gnome! Do you ever get an idea in your head that will not let you sleep until it’s made? As with all of my DIY felt gnomes, that was the case with this adorable Easter gnome, friends. I made sketch after sketch to get the plan just right and here he is. A Scandinavian gnome dressed up for Easter! 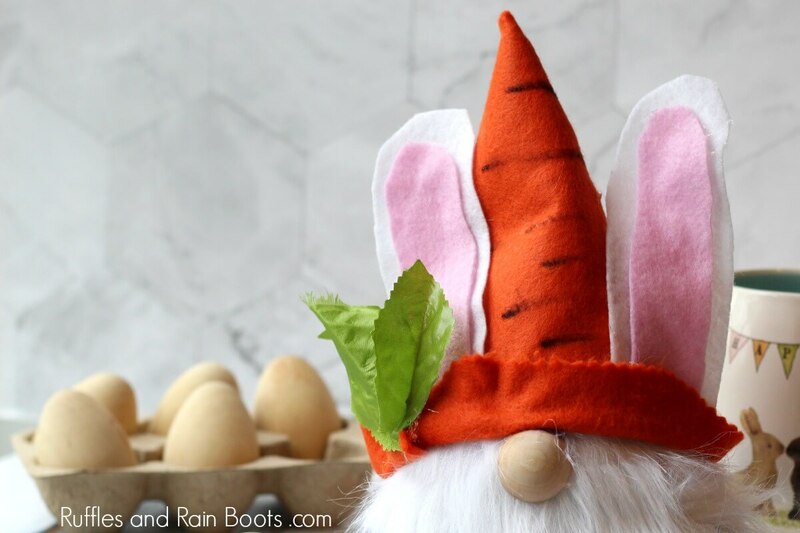 This Easter bunny gnome got all dressed up for the holiday and is decked out in a carrot-inspired gnome hat and has the most endearing little bunny ears. If you gave him a little egg basket, wouldn’t he just look the part?! Let’s get started on our newest Ruffles and Rain Boots gnome tutorial. 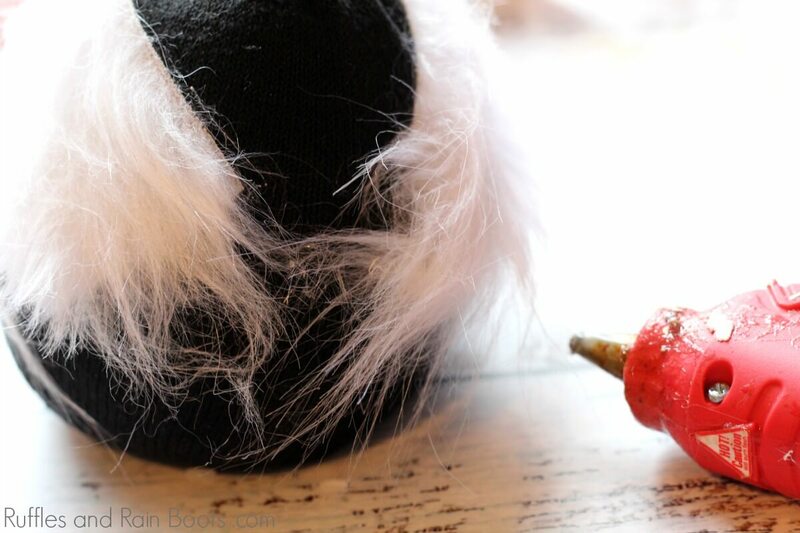 Psst: click here to learn the basics on how to make sock gnomes. How Do I Make an Easter Gnome? I’m so glad you asked! If you’re making a video playlist on YouTube of gnome tutorials, you can find our Easter Gnome video tutorial here. Otherwise, keep on reading. This adorable no-sew Easter gnome makes a cute addition to any decor. From the carrot hat to those floppy ears, this Easter bunny gnome will hop into your heart. 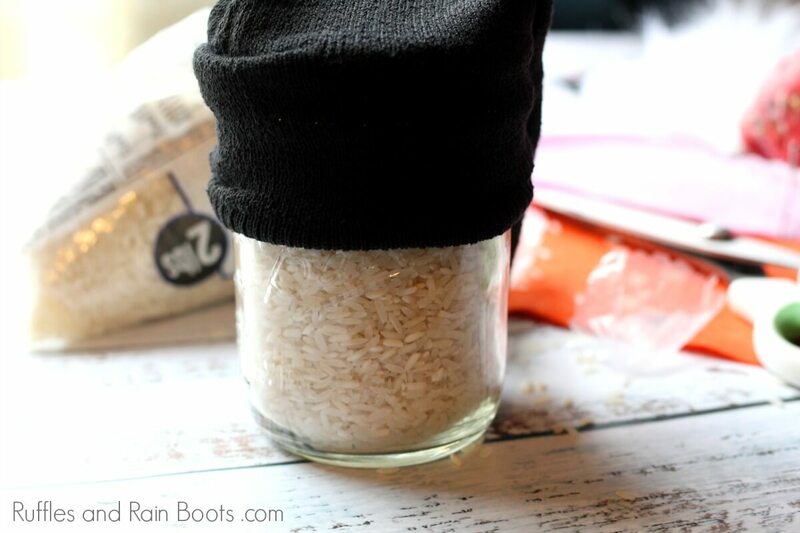 Place rice in a jar and put the sock opening over the top. 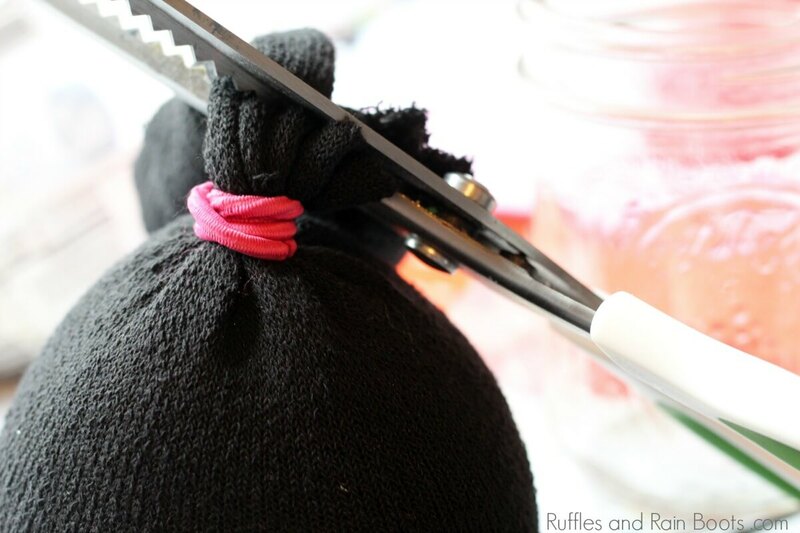 Flip the jar to easily fill the sock with rice. Make sure the sock is full but leave enough room to secure the top with a rubber band. Trim excess fabric. 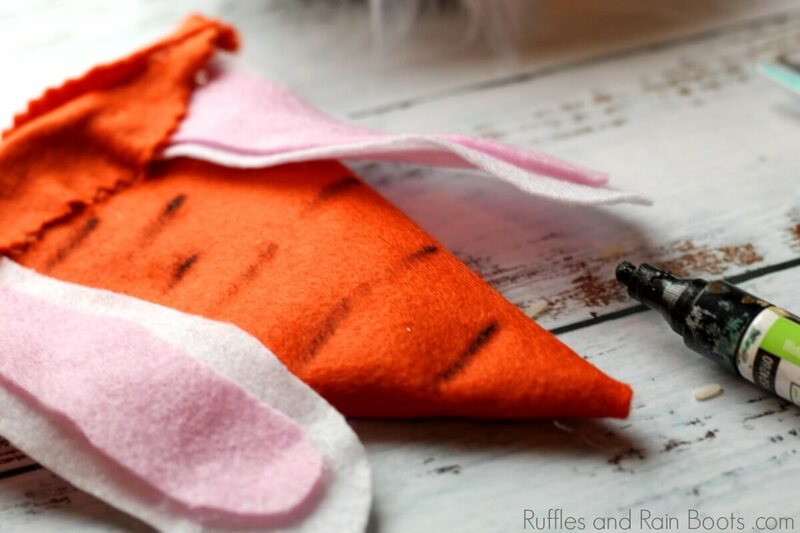 Use a razor blade to cut the craft fur (the backing only) into a triangle that is about 9 inches at its widest point and as long to touch the bottom of rice-filled sock body. Your goal is to cut it long enough to wrap it around most of the body. Secure it to the sock with hot glue. Roll orange craft felt into a cone shape and glue down the side. Trim the bottom so that it is even(ish). We used pinking shears to give the gnome hat some character. Fold the bottom up to make a cuff but do not secure. Set aside. From the white felt, cut two ear shapes about 5 inches tall with a rounded top edge. Repeat with the pink felt, cutting them slightly smaller. 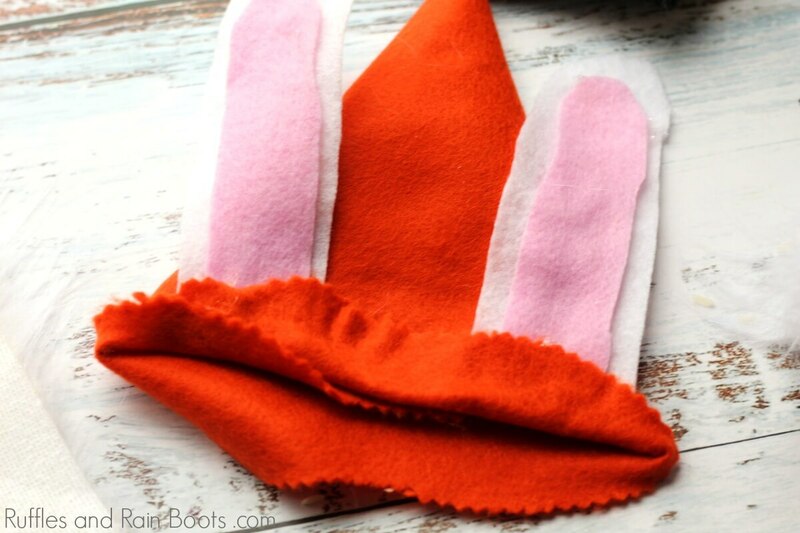 Glue the pink felt into the middle of the white felt to make bunny ears. Unfold the cuff of the hat, making a note where the fold was. Secure the bottom edges of the bunny ears to that fold, flip up the cuff again, and secure the cuff down with glue. 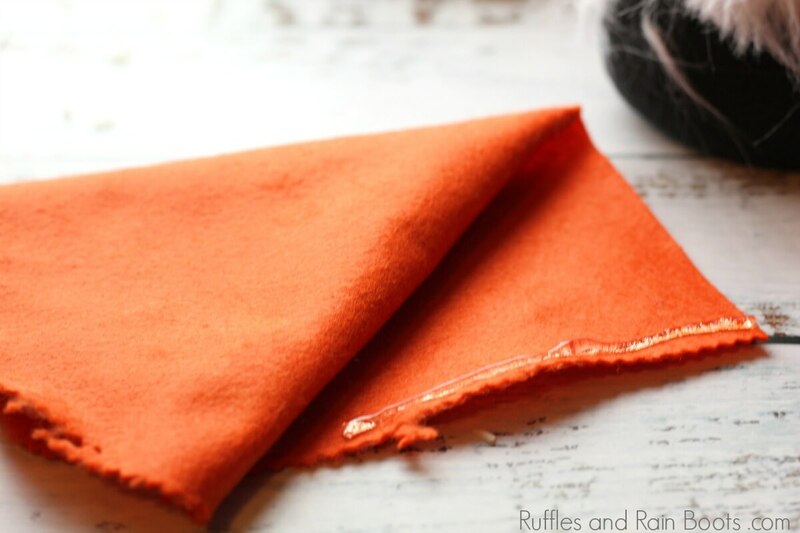 Add horizontal lines on the orange felt to mimic a carrot. Place the hat onto the gnome and secure with hot glue. Place the gnome nose under the brim of the hat and glue on any extras (like the leaves we used). 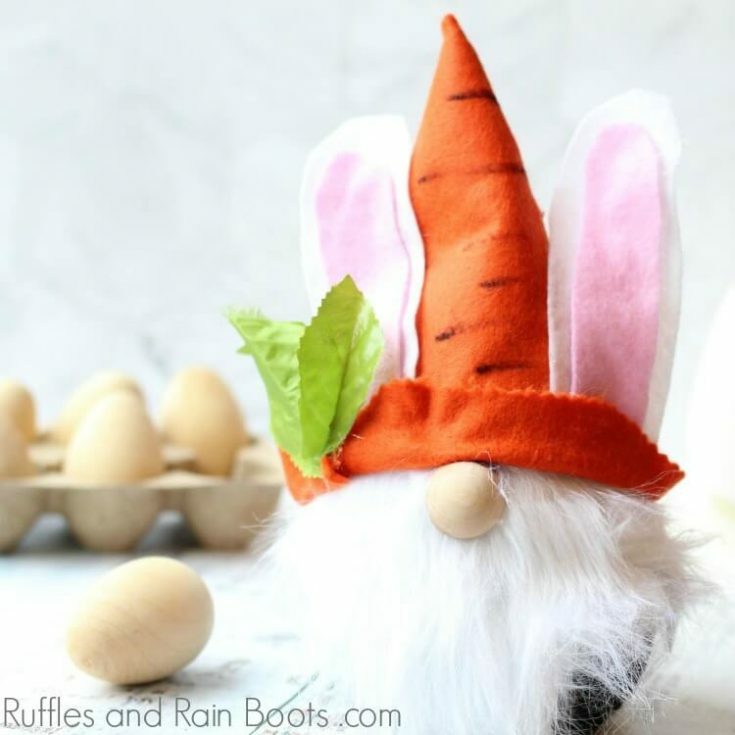 For more gnome crafts than you'd ever think could be in one place, visit Ruffles and Rain Boots .com (your source for fun gnome DIY projects). We love making crafts here at the ‘Boots and would love to share them with you. Sign up to receive our weekly newsletter and you’ll get access to the Hand Lettering Library (full of free practice sheets and instructions) and the Exclusive Library (full of free cut files for cutting machines, tips on our favorite craft mediums, and all things fun)! Let me just be the first to admit that I have had a gnome invasion. For a few years, tomte, nisser, gnomes – whatever you want to call them – have taken over as the go-to decor pieces. From our popular 15-minute Christmas gnome ornaments to our first little 30-minute Scandinavian gnome tutorial, I love coming up with new designs. Your shares are how this site grows and I am sincerely grateful for them.